At the school carnival, Lisa has a caricature drawn of herself, which makes her think she's ugly. To boost her spirits, Homer sells his ticket to ride the Duff blimp to enter her in a beauty pageant. Bob Hope guest stars in this episode, joining the newly-crowned Lisa on a USO tour. The 89-year-old Hope recorded his lines from his home. This episode features Ralph Wiggum, about a dozen episodes away from his character-defining, breakout episode "I Love Lisa", commenting that Lisa's chewing gum walk is, "ver-ry Wrigley". Groundskeeper Willie hawking haggis at the school fair is how I first learned about haggis. "Get your Haggis right here! Chopped heart and lungs boiled in a wee sheep's stomach! Tastes as good as it sounds." Marge: Lisa, I know a song that will cheer you up. 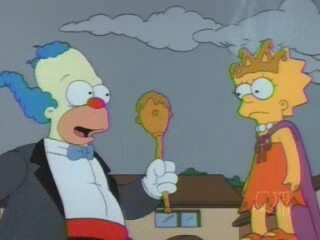 "There once was an ugly duckling..."
Lisa: So you think I'm ugly?! 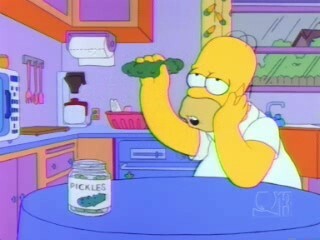 Homer: Hey, nobody's prettier than my little girl! Marge: Mmmmm, you're looking at her through a father's eyes. Homer: Well if I could gouge out somebody else's eyes and shove them into my my sockets I would; but to me, she's beautiful! Homer: I dunno. Was I drunk? Lisa: Possibly. But the point is you wanted me to feel better about myself, and I do. Back in the olden days, when I was making an effort to record every episode of The Simpsons on VHS for my continued viewing pleasure, this was an episode I never managed to get on tape. As a result, it's always carried a strange fascination for me, as I was never able to watch it as readily as other episodes. 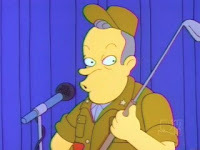 Continuing the season's tendency to tell stories that effortlessly blend the heartfelt with the hilarious while tossing in oodles of pop culture references (here we get Apocalypse Now, the Hindenburg, Joe Camel, the JFK assassination and a variety of beauty pageants), this episode doesn't reach quite as much as "Homer the Heretic" nor is it as laugh-a-minute as the Halloween episode which follows it, but it's still a solid episode that continues a strong season. 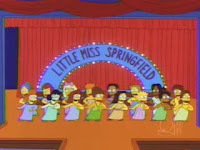 Though the "guy you wouldn't expect to know anything about beauty pageants is actually an expert" trope is pretty standard these days, I've always particularly enjoyed Bart's surprising knowledge of beauty pageants since I first saw this episode, particularly his assertion, after teaching Lisa to walk in high heels, that's he starting to think he could win. Nothing terribly groundbreaking, but it continues the season's strong showing while telling a sweet Homer/Lisa story. The 'Bart walks in heels' thing always cracked me up and is one of those Simpson's moments that i've always remembered (even though i didn't remember anything else about this ep other than Lisa's in a pageant. Your post has refreshed my memory). i always appreciated episodes where Homer is actually a good dad, so i liked this episode. @Anne: i always appreciated episodes where Homer is actually a good dad, so i liked this episode. Yeah, I much prefer the episodes where Homer means well and just has to work harder at being a good dad than the ones where he's just a jerk about it. You're right. The fact that this episode isn't like it all is a sad testament to how that sort of thing has changed in recent years.